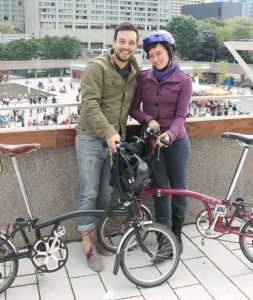 We’re two Canadians who love to cycle and travel, and in 2012 we decided to roll those passions into one by getting Bromptons! Now that we have bikes we can fold up and bring anywhere, we’re exploring the world on two wheels and sharing our adventures here. Our experiences traveling with Bromptons, whether that’s cycling cross-country (like in Cuba) or multimodal travel from city-to-city with bikes, trains, ferries and planes (like in The Netherlands). Traveling Adventures – This is where we post about the places we’ve traveled on our Bromptons. The category is divided into subcategories based on country. We always try to include details about our route, helpful tips, and lots of photos. Local Adventures – We don’t just ride our Bromptons when we leave home, we ride them all around Toronto too! So this is where we post local stuff, like the Brompton Urban Challenge Toronto, cycling on the PanAm Path, and the best places to ride in our city. Bike Stuff – This is a catch-all category for posts about Brompton bike specs, cycling gear and components. In 2018 we cycled Chicago in the spring and Yucatan, Mexico over the Christmas holidays. Blog posts are coming! To keep up with our adventures, you can now subscribe by entering your email at the bottom of this page. In 2019 we’ll also do more posts about cycling in Toronto, because despite the uphill battle with local politicians to install more bike lanes, it’s got a lot of excellent places to ride one’s Brompton. Hey there! I am one of the guys from Toronto that you met at the Piño Colada stand by the bridge. How did your trip go? I am curious if it all went well as it sounded very interesting. I have a few pics of us having a piño colada that I can send if you want to send back your email address. Hi Fred! Glad you found us. Pier has sent you an email so you can send the pics. Can’t wait to see them! I’m slowly posting blogs about our trip, so stayed tuned! Thanks so much, Newton! We very much want to visit New York. I (Heather) went over a decade ago, long before all the new cycling infrastructure was installed, so I really want to go back and check that out. I’ve bookmarked the #BromptonNYC Meetup page, so we will for sure get in touch with you guys when we are in NYC! Thank you so much to share this page – very interesting to read about your cycling in the Netherlands seen from your point of (Toronto) view. I enjoy following you. Awesome! Although I don’t enjoy much adventure, I’ve found your pages so interesting! How about Seoul as your next travel ? Fall would be a perfect season!